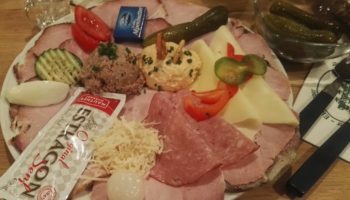 The area near the Hohe Wand continues to surprise by its good food and bad drinks. Haselbacher is a rather inconspicuous Heuriger in a slightly dull village of Willendorf, yet its Brettljause is on par with some of the best Mostviertel’s offerings. 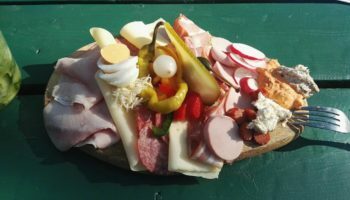 The wooden board may be missing, and the cheese remains wishful thinking, but the meats on this creation are varied, unusual and tasty. The meaty spread is very well spiced and hardly tastes of liver. The blood sausage does not overwhelm quantity-wise like at some other locations and is not disgusting. The jelly is 95% meat and 5% jelly, which are exactly the proportions I find acceptable. Then comes a strange pink sausage looking a lot like minced meat glued together and having a subtle salty taste. 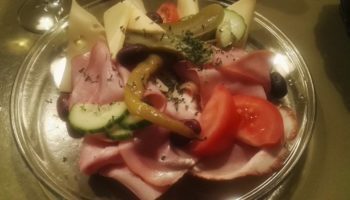 The Schweinsbraten are totally competent, as are the Stelze slices. 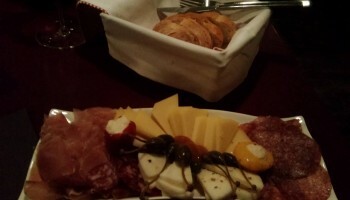 These are supported by two types of ham, both salty and very non-industrial. Best of all are thick slices of nearly fat-only Speck with a distinctly smoky taste and a piece of a long sausage with huge lumps of fat inside, which feel crunchy on the teeth and melt in the month long before the meat can be chewed. All these goodies are served with perfectly fresh bread, horseradish, Pfefferoni and – if you order it – one of the best mixed salads in Austria. 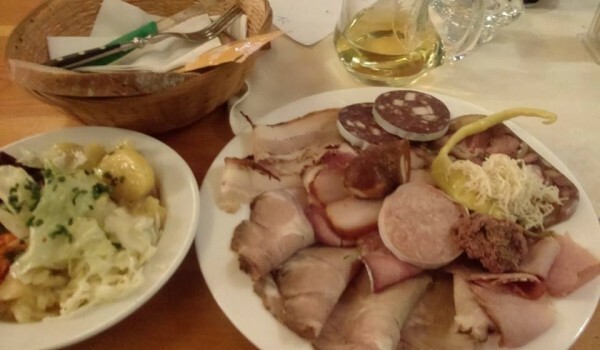 This Heuriger, maybe due to its limited opening periods and a wide choice of cold and hot dishes, seems to be extremely popular with the locals. I entered it shortly before 12pm and had I come five minutes later I would not have found a table. Unfortunately, the number of visitors did have an impact on the staff’s efficiency. The wine took quite a long time to arrive, forcing me to slow down my eating, and when it came, it was a 1/8l glass instead of the ordered quarter. But this is a very minor complaint because I was eventually charged for 1/8l by another mistake and because the wine turned out crap anyway. When Hastelbacher is open, it can be a perfect place for a quick and quality Brettljause during a half-day escape from Vienna. 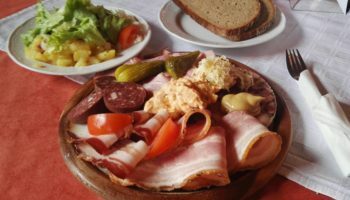 What is even more inspiring is that the buffet at this Heuriger serves many more types of sausage than those that appear on the standard dish, including even some game, so there is a good opportunity to build your own super-Brettljause.